The colors were incredibly vivid. 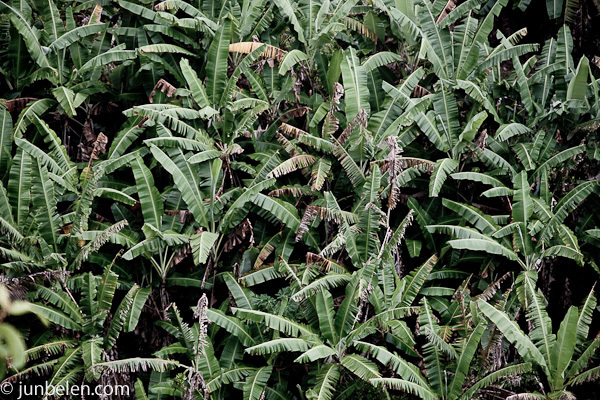 Lush green foliage. Volcanic black rocks. Water cascading through a series of pools, flowing into the seemingly boundless deep blue sea. The view of the gulch from the old, moss-covered bridge along Highway 31, was absolutely stunning. I managed to filter out the cackle of tourists and drift dreamily with the gentle rustle of the bamboo trees. It was, indeed, a mystical place. 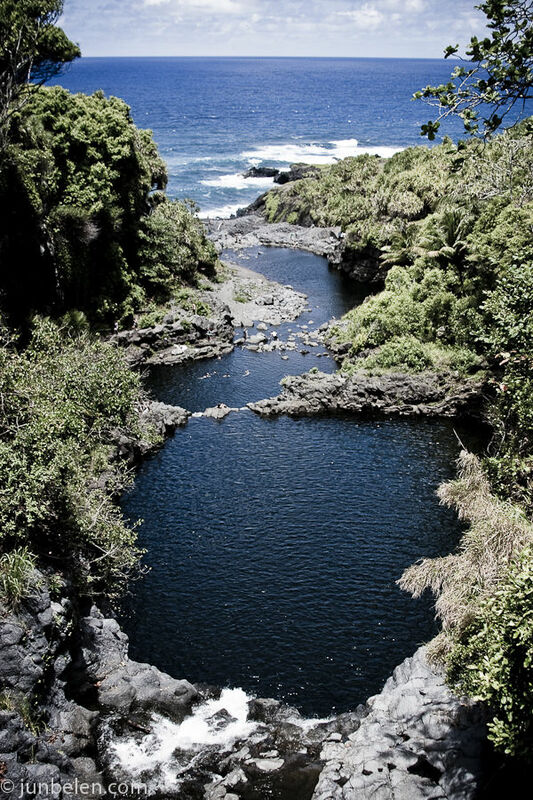 The Seven Sacred Pools at the Kipahulu end of the glorious Haleakala was our last stop on our long Road to Hana. After a quick dip in the cool, crisp water — a much needed relief from the heat of that July afternoon — we turned around and drove back to Paia, where our journey began. We discovered a roadside cafe humbly set in a local’s front yard and treated ourselves to plate lunches of barbecued chicken, rice, and macaroni salad. The chicken was cloyingly sweet but the meal was satisfying, nonetheless. For some strange reason, it felt very much like home. Maybe it was the Filipino family who prepared our meal or the long-haired mutt who cheerfully greeted everyone with a big, wet smile. Mile marker after mile marker, we retraced our journey along Maui’s most celebrated road. The jagged jet-black beaches of Waianapanapa at Mile 32. 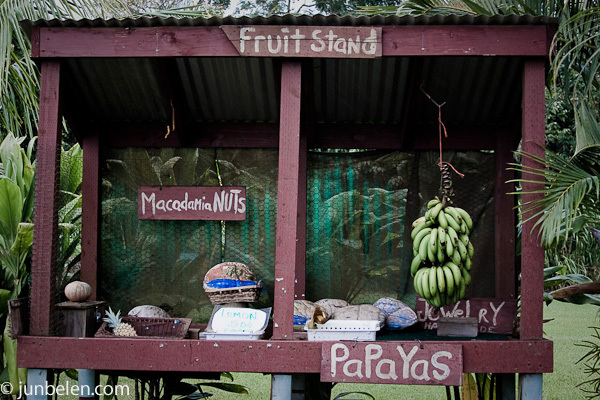 The fruit stands brimming with papayas and pineapples in Nahiku at Mile 25. The nearly vertical Waikani Falls in Wailua at Mile 19. 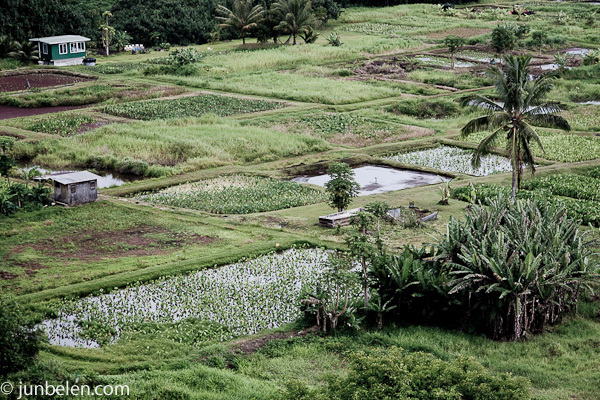 The checkerboard taro fields in Keanae at Mile 17. The Crouching-Tiger-Hidden-Dragon-esque bamboo forest at Mile 7. The daring windsurfers in Hookipa Beach at Mile 9. Then we were back at where we started, at the Minit Stop, the convenience store next to our bed and breakfast. Minit Stop has the best Spam musubis in town — fried Spam on a bed of rice held together with nori. At first, it bothered me that they spelled Minute, Minit (or maybe I just didn’t get it?) But it all seemed forgivable after I saw the trays of Spam musubi and fried chicken inside their humble store. Who knew you can get soda, sunblock and Saran-wrapped Spam musubi all in one place? Only in Hawaii, I guess. Cold fried chicken with rice, Spam musubi, a bottle of water, and a bar of Twix — all wrapped in a brown paper bag. It was the perfect Hawaiian picnic lunch for the perfect Hawaiian road trip. It couldn’t get better than that. I had my first taste of the Hawaiian staple not too long ago but I am no stranger to Spam, having grown up with this comfort food in a can on our dinner table. My mom would make fried garlic rice and fried eggs for Spam-silog breakfasts and would fix Spam pan de sal sandwiches for merienda. Last weekend, while Dennis and I planned another trip to Hawaii, this time to the Big Island, I made Spam musubi for lunch. I sprinkled nori komi furikake on the rice before I laid the slice of fried salty-goodness on top to give it a delightful sweet-savory crunch. Every bite took us back to our incredible road trip in Maui and made us look forward to the volcanoes in the Big Island even more. Fry Spam slices over medium heat until golden brown, one to two minutes each side. Lay the fried slices on paper towels until the musubis are ready to be assembled. Fill the Spam musubi mold to the brim with freshly steamed rice. Press down the rice and sprinkle the top with nori komi furikake. 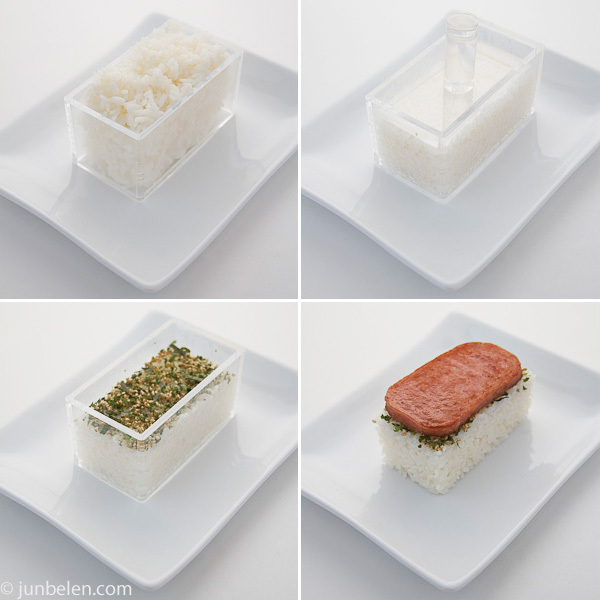 Carefully remove the musubi mold and then lay a slice of fried Spam on the bed of rice. Trim the nori sheets into roughly 2-inch by 7-inch rectangles. Wrap the musubi with nori. If the rice is warm enough, the nori sticks beautifully to the rice. Otherwise, moisten the ends of the nori with water to seal. 1. A cup uncooked rice is roughly equivalent to two to three cups cooked rice. 2. Buy nori sheets that are used in making temaki or cone sushi. 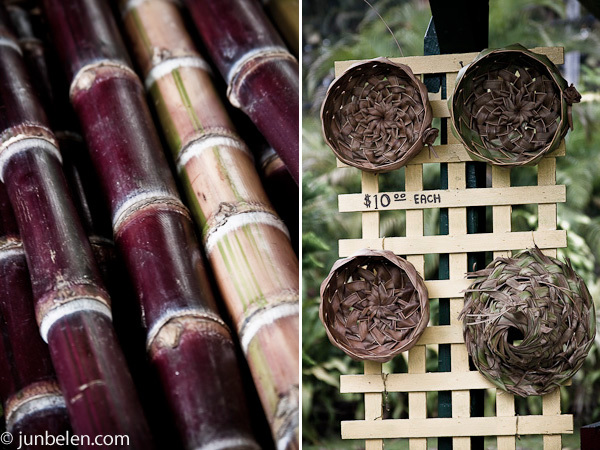 These have the right length, roughly 7-inches. Trim the width to around 2 to 2-1/2 inches. 3. Spam musubi molds are available in most Japanese grocery stores like the Nijiya Market in Japantown in San Francisco. An empty can of Spam with both ends cut open can also be used in place of a musubi mold. Just be careful since the edges may be sharp. Use a fork to press down the cooked rice. 4. Homemade nori komi furikake can be made by mixing toasted sesame seeds, salt, sugar and nori cut into tiny pieces. I saw spam musubi at L&L when I was in the Bay Area awhile back and now I’m regretting not having tried it! 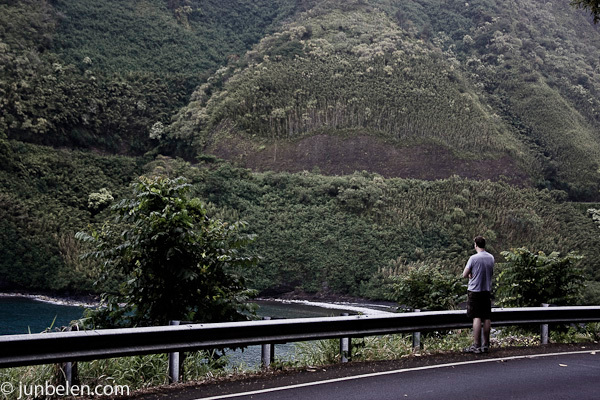 My family and I also drove the Road to Hana when I was younger and I fell in love with the natural beauty there. Your photos really brought back good memories, so thanks for that. I always look forward to your posts. Inspiring photography. Ah, I miss Maui!!! Loved this drive when I did it in August. Those roadside fruit stands were a favorite! Funny, I bought some coconut candy which I devoured. Then, I found a KIND Bar at Whole Foods made of a very similar sliced and oven-roasted coconut. So delicious! And reminds me of the Road to Hana every time I snack on it. Yum, grew up on this. My Dad’s family is from Kauai! Packing bags right now! I was in Hawaii when I was four and haven’t been back since. These pictures are certainly helping the case for a return trip! Awesome. Spam makes a showcase again! I seriously need to have a go at it. I’m curious. Time to book a flight now! Thank you! I think you mentioned once before that your family is from Hawaii. I didn’t know they’re from Kauai. That would be our next trip after the Big Island! This makes me want to pack my bags and go right now to the Big Island. I was there for my Honeymoon, it was incredible and not just because it was my honeymoon. As for the spam musubi you make it look so good, not like the ones we buy from 7-11. Go for it! You should give it a try, Stephanie! As you know, normally I like completely unprocessed foods, but I am a sucker for spam musubi and plate lunch in Hawaii. 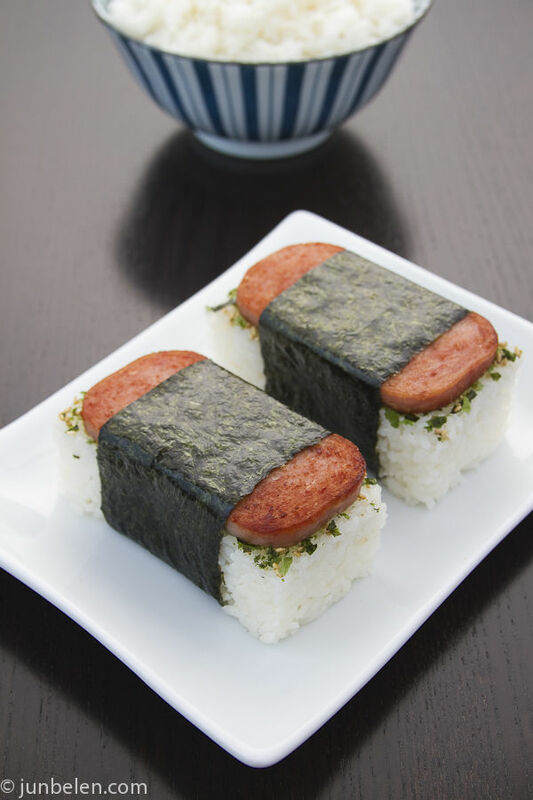 I’m impressed that you made spam musubi look elegantly artful in your photos! What gorgeous scenery! I love that close up picture of the bananas. Sigh, now I want to go..
That’s one of the things I miss most about Hawaii: the food. My family and I went to Kauai in December celebrate my mom’s retirement and to visit relatives and her childhood home. My diet consisted of sweet bread, Portuguese sausage, Hawaiian Sun drinks and Spam musubi the entire time I was there. It was glorious. 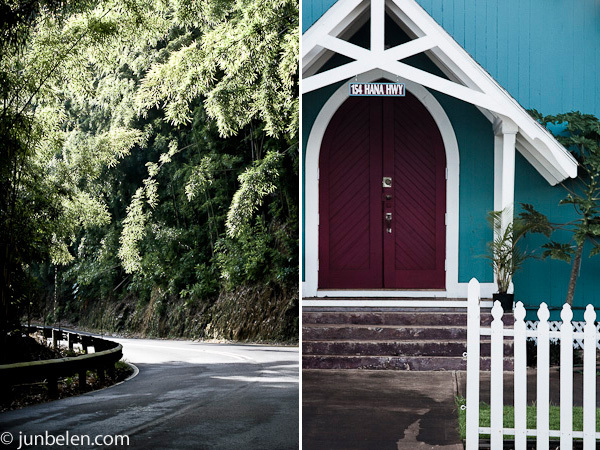 Kauai is the only island I’ve spent time on – I would love to visit Maui one of these days. That drive looks beautiful. My family (husband and daughter) loved spam musubi when we visited hawaii, they could live on it. We made it few times trying to recreate the recipe but now I see we got it all wrong. Those molds are so cool!! Have never heard of Spam musubi before coming to the US, but I did get my fair share of this canned meat while growing up Hope you’re having a fantastic trip! I love Spam Your span version of musubi looks beautiful and it’s one more thing I can make with Spam. I loved Hawaii and would love to go back someday. Jun – the photos are amazing! I have only been to the islands once and we went to Maui and drove to hana. We ate at the Hali’imaile General Store and it was excellent. Love the unique molds and how you made spam interesting. Happy Saturday! Oh wow, that set of photos from Hawaii (from your previous trip? Or this one?) is absolutely incredible, Jun! Gorgeous color palette and such lush scenery… I really need to get myself over there. Hope you and Dennis are having a wonderful trip! Thank you, Angi! I’m thrilled somebody noticed my color palette! Hi Jun, Stephanie from “Together in Food” suggested i check out your blog. 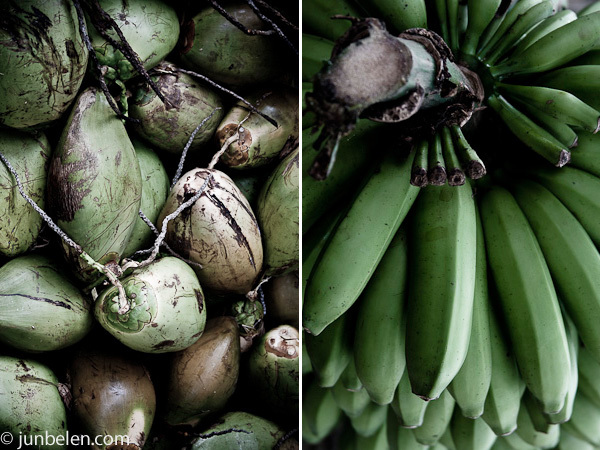 Love your beautiful shots of the tropical landscape as I sit here in the NYC freezing cold. When Erin and I were in Hawaii, I naively expected that there would be some kind of Spam option on every menu. About a week into the trip, I knew I had to take matters into my own hands. Our host at the B&B was disappointed, but understanding of my need to forgo the complimentary breakfasts and seek out spam fried rice, spam loco and musubi. We have not yet been to Maui, so alas, no Minit Stop. What is special about the musubi there? I guess what made it special was that we found the musubis in a convenience store in a gas station next to our B&B. It was serendipitous! And the fried chicken was not bad at all!! I saw this everywhere in Hawaii and really regret not trying it. Maybe this is the Spam secret I’ve been missing out on! In some versions of masubi they use some sort of a sauce in between the spam and rice. It looks similiar to terriyaki sauce, but I’m not sure. Are you familiar with this sauce, if so, do have the sauce recipe. I don’t really think it’s terriyaki, it’s usually has a thicker more gelatanous consistency. Also, where did you find that masubi mold. That is much safer than the empty Spam can method!! LOL! I got the musubi mold from a Japanese grocery store. I’m not so sure if Asian stores would carry this. It’s definitely better than using the can. No need to worry about cuts! I think you’re talking about a teriyaki sauce or something like soy sauce and sugar. 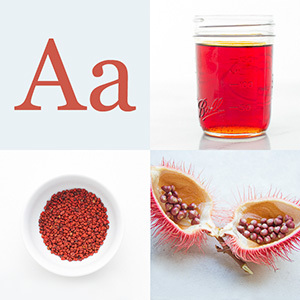 http://bit.ly/WWF7 I’d start with equal amounts of soy and sugar then adjust the taste to your liking. I’d also add a little oyster sauce or even hoisin.